The Merit-Based Incentive Payment System (MIPS) is an incentive program run by the Centers for Medicare and Medicaid Services (CMS) as one of two tracks within the Quality Payment Program (QPP). All eligible Medicare Part B clinicians are required to participate in MIPS by reporting data in four performance categories — Cost, Quality, Promoting Interoperability and Improvement Activities. For each category, clinicians select performance measures that best suit their practice, and then collect data on those measures for the entire performance year or a period within in the performance year. Cost: 15 percent of the final score, up from 10 percent in 2018. Quality: 45 percent of the final score, down from 50 percent in 2018. Promoting interoperability: 25 percent of the final score, the same as 2018. Improvement activities: 15 percent of the final score, the same as 2018. CMS uses a clinician’s total performance score to apply a positive or negative payment adjustment to their Medicare Part B reimbursements. For 2019, clinicians and groups must earn at least 30 MIPS points to receive a neutral payment adjustment, as cited in the 2019 QPP Final Rule. Clinicians earning higher than 30 points may receive a payment bonus of up to 7 percent, while MIPS-eligible clinicians who receive lower than 30 points or who fail to participate in MIPS will receive as much as a negative 7 percent payment adjustment. Payment adjustments are applied two years after the performance year — for the MIPS 2019 performance year, clinicians will receive a payment adjustment in 2021 for all Medicare Part B services billed in 2019. First introduced in 2017, MIPS has been revised each year since its implementation to better meet CMS’s goal of shifting the healthcare industry towards more value-based care. These changes aim to improve quality of care and patient outcomes, driving improvements in healthcare services and reducing the overall cost of care. If behavioral health clinicians hope to earn a high MIPS score in 2019, they must become familiar with the new requirements and changes. In this MIPS overview, we will outline the 2019 MIPS changes in each performance category as well as new participation and performance requirements so your practice can earn MIPS success in 2019. The Cost category will account for 15 percent of a clinician’s overall MIPS score for the 2019 MIPS — a 5 percent increase from 2018. This percentage will continue to increase in future performance years, as the Bipartisan Budget Act of 2018 stated that the Cost category must be weighted at 30 percent by 2022. According to the 2019 QPP Final Rule, CMS plans to increase the weight of the cost performance category by 5 percent each performance year to meet this target. For the cost performance measures, the 2019 MIPS will retain the Medicare Spending Per Beneficiary (MSPB) and Total Per Capita Cost (TPCC) measures used in previous years, but will also add eight new Episode-Based Measures. These episode-based measures are categorized as either procedural or acute inpatient medical condition episodes and include measures such as Knee Arthroplasty and Simple Pneumonia with Hospitalization. All participating clinicians and practices will be evaluated based on the same ten Cost performance measures. However, if a clinician does not meet or exceed a specified case minimum for any of these measures, the percentage for the Cost performance category will be added to the Quality category instead. Because behavioral health clinicians do not perform the episode-based measures, their Cost percentage will be shifted to the Quality performance category instead — The typical score breakdown for behavioral health clinicians will be 0 percent for Cost, 60 percent for Quality, 25 percent for Promoting Interoperability and 15 percent for Improvement Activities. CMS collects and calculates Cost data based on Medicare claim submissions, so clinicians do not need to submit any additional data for the Cost performance category. Because most behavioral health clinicians will not meet the minimum case requirements for the new episode-based measures, they will see a higher percentage of their MIPS score percentage shifted to the Quality performance category in 2019. In 2019, the MIPS Quality performance requirements will remain mostly the same as in 2018. Clinicians are required to report data for at least six Quality measures, with at least one Outcome measure. If no Outcome measures apply to a specific practice, the practice can submit a High Priority measure instead. Practices that submit two or more High Priority Quality measures can also earn bonus points to boost their Quality score. The Outcome measures within the Mental/Behavioral Health specialty measure set include Depression Remission at Six Months, Depression Remission at Twelve Months and Adherence to Antipsychotic Medications For Individuals with Schizophrenia. The most significant change to the Quality performance category for 2019 is the addition of eight new Quality measures and the removal of 26 old Quality measures that CMS deemed duplicative or too easy. Of the new MIPS quality performance measures, one that may be applicable for some behavioral health clinicians is the Continuity of Pharmacotherapy for Opioid Use Disorder (OUD) measure. This measure is also a High Priority measure, as all opioid-related Quality measures are now counted as High Priority measures for the 2019 performance year. In 2019, behavioral health clinicians can no longer report on the Bipolar Disorder and Major Depression: Appraisal for alcohol or chemical substance use Quality measure as it has been removed. Luckily, clinicians can select their own Quality measures to report on, including choosing to report within a specialty measure set that best matches their practice. The Mental/Behavioral Health specialty measure set includes 25 Quality measures this year — 12 of which are High Priority measures and three of which are Outcome measures. Measures within this set cover a variety of specialties in the mental and behavioral health fields, including dementia, depression, and drug and alcohol use. Clinicians can also report on measures related to preventive care and medication documentation and management. Practices that submit two or more High Priority Quality measures can also earn bonus points in the Quality performance category to improve their overall MIPS score. Submit data using End-to-End Electronic Reporting: Clinicians that report their Quality data directly from certified electronic health record technology (CEHRT) using End-to-End Electronic Reporting can earn bonus points in the Quality category. Earn a bonus for being a small practice: Practices with 15 or fewer providers in their Associated Taxpayer Identification Number (TIN) earn six bonus points in the Quality category if they submit on at least one Quality measure. This small practice bonus is increased from the five-point bonus offered in 2018. Additionally, if a small practice can meet the completeness requirements for a Quality measure, they will still earn at least three points for that measure. Display improvement from the previous year: Practices and clinicians that show improvement in their Quality score from the previous MIPS performance year can earn up to 10 additional percentage points. Many behavioral health clinicians will have a higher percentage of their total score shifted to the Quality category and can benefit from these opportunities to earn additional Quality points. Quality measures are reported for the entire duration of the 2019 performance year — from January 1 to December 31. Clinicians must submit data for at least 60 percent of eligible cases during that year. The Promoting Interoperability (PI) performance category saw some major changes for MIPS 2019, including a new scoring methodology, stricter reporting requirements and some changes to the PI measures. In 2018, PI measures were scored as a base score, performance score or bonus score measure, but in 2019 clinicians must submit a single set of measures that are all scored based on performance. Clinicians will submit a numerator and denominator for each measure that will then be used to calculate a total score for that measure. For example, to complete the Support Electronic Referral Loops by Sending Health Information measure, clinicians who are referring or transitioning a patient must create a summary of care record using CEHRT and electronically exchange that record to the new provider. The denominator for this measure is the number of transitions of care and referrals performed during the performance period and the numerator is the number of transitions of care and referrals during the performance period where a summary of care record was created and exchanged using CEHRT. A performance rate for that measure will be calculated by dividing the numerator by the denominator. The performance rate will then be multiplied by the available points for the measure to determine the total score for the measure. In the previous example, if a provider had 250 transitions of care and referrals during the performance year and used CEHRT for 225 of them, their performance rate would be 0.9. The available point value for the Support Electronic Referral Loops by Sending Health Information measure is 20, so the provider would earn 18 points based on their performance rate. Clinicians are required to report measures from each of the four objectives to complete their PI requirements. Failure to submit for a required PI measure without claiming an exclusion for that measure will result in a score of zero for the entire PI performance category score. If a clinician does claim an exclusion for one of the PI measures, those percentage points will be reallocated to the Quality performance category. For the e-Prescribing objective, clinicians will also have the opportunity in 2019 to earn bonus points for two additional measures — Verify Opioid Treatment Agreement and Query of Prescription Drug Monitoring Program (PDMP). Practices and clinicians can earn five points for each bonus PI measure submitted. The Security Risk Analysis measure was also included in the PI requirements for previous years, but in 2019 it will no longer earn a score. For reporting PI measures in 2019, all clinicians will be required to submit with 2015 CEHRT. In 2018, clinicians still had the option to submit with 2014 Edition ONC CEHRT as they transitioned into the MIPS program. While the 2015 CEHRT requirement may pose a challenge for practices currently operating with 2014 CEHRT, the 2015 Edition CEHRT offers several advantages over the previous edition with one notable improvement being the Application Programming Interface (API) functionality. The API functionality establishes programming protocols that allow patients to access health information in a more flexible way than through many other patient portals. The API functionality of 2015 CEHRT can allow patients to view their health information easily and securely through third-party applications. Clinicians also have access to protected health information (PHI) of patients through safe and secure technology. PI performance data must be collected during at least a 90-day continuous period in 2019 — the same requirement as in previous years. Clinicians also have the option to submit an application for a hardship exemption for the PI category if they are a small practice or do not have access to 2015 CEHRT. Some clinician types — including clinical psychologists — and providers with Special Status will also be automatically excluded from the PI category. Like the PI category, IA activities will need to be performed for a continuous 90-day period. The submission process for MIPS data will remain mostly the same for 2019, with a small adjustment in the Quality performance category. MIPS will now allow clinicians to submit their Quality measures through more than one submission type. For example, a practice could submit a Quality measure through both Medicare Part B claims and electronic Clinical Quality Measures (eCQM). If Quality data is submitted through multiple submission types, CMS will use the one that receives the most points when calculating the total MIPS score. The ability to submit through multiple submission types also provides more room for clinicians to choose the Quality measures that best suit their practice. The other notable change to MIPS data submission for 2019 is that large practices — those with 16 or more providers in the TIN — can no longer submit data via Medicare Part B claims. Only smaller practices can use this submission method in 2019 as CMS aims to move away from claims reporting in future years. The auditing requirements for 2019 will remain the same as in previous MIPS performance years. MIPS data is auditable for up to six years after the submission date. CMS may audit practices on a selective basis, and those practices will be required to submit documentation, such as medical records for patients, within 45 days. 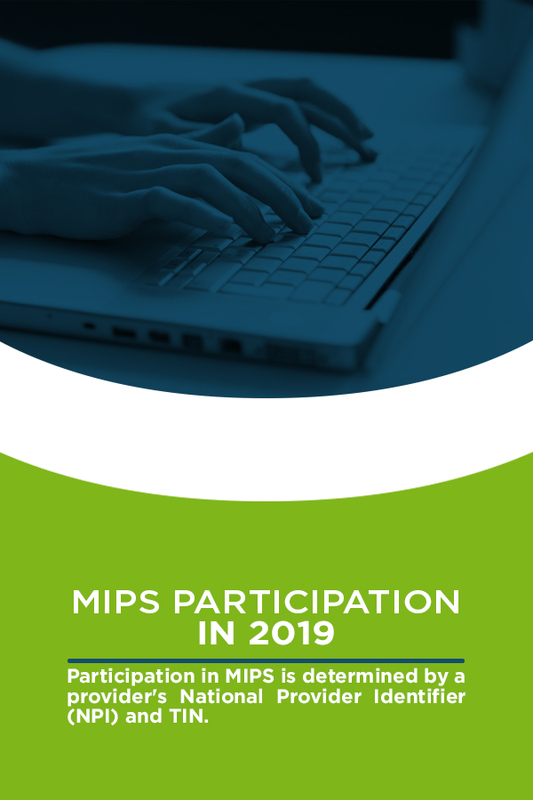 With these additional clinician types, more clinicians and practices will be eligible for MIPS participation in 2019 — CMS estimates that about 798,000 clinicians will be eligible for MIPS participation in 2019. However, the criteria to qualify for a low-volume exclusion has also been expanded for 2019, so more small and low-volume practices will be exempt from MIPS participation in 2019 as well. In addition to the two low-volume thresholds established for the 2018 — care provided for 200 or fewer patients and $90,000 or less allowed charges for Medicare-covered professional services — MIPS clinicians are also excluded from MIPS in 2019 if they provide 200 or fewer professional services covered under the Physician Fee Schedule (PFS). To qualify for a low-volume exclusion, clinicians must only fall below one of the low-volume thresholds. Starting in the 2019 performance year, clinicians also have the option to opt-in to the MIPS program if they meet or exceed at least one of the low-volume thresholds. When a practice opts into MIPS participation, they can receive a bonus or penalty based on their performance for that reporting year. After electing to participate in MIPS, clinicians cannot revoke their decision and must submit data for that performance year. Small practices can also participate in MIPS through voluntary participation. Practices that choose to participate voluntarily will report their MIPS data for the year and receive a MIPS score, but will not be subject to a payment adjustment. This is an excellent option for smaller practices that want to gauge how they would perform before opting into the MIPS program. MIPS performance standards will increase slightly for 2019 — clinicians and practices will now need to earn 30 points to receive a neutral payment adjustment and more than 30 points to earn a bonus in 2021. For 2018, the criteria for a neutral payment was just 15 points. The performance standard for receiving an exceptional performance bonus has also increased from 70 points in 2018 to 75 points in 2019. Due to this performance standard increase and the more challenging rules, CMS predicts that the median MIPS score for 2019 will be 78.72 — more than ten points lower than the median score for 2017. If behavioral health clinicians want to earn a high MIPS score in 2019, they must be prepared to meet these new requirements and more challenging rules. When collecting and submitting MIPS data, it is essential to work CEHRT that supports your practice with the right features and functions. ICANotes provides 2015 Edition Certified EHR specifically designed to meet the needs of the behavioral health specialty. Our comprehensive EHR system offers features that make your job easier — such as intuitive electronic charting and streamlined billing systems — while also meeting the MIPS 2019 requirement for 2015 CEHRT. The ICANotes electronic Patient Portal features the required API functionality that makes it easier for you to take better care of your patients. Explore the features of our comprehensive and efficient EHR system or request your free trial to get started.